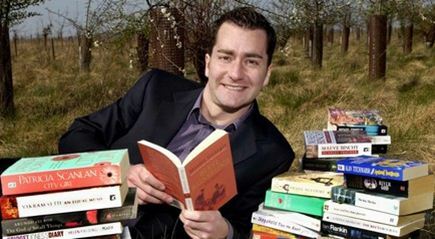 Thanks once again to Smarta.com for this inspiring business start-up story, this time featuring books (a subject close to my heart). They have interviewed Barry Crow the founder of Green Metropolis about how he came to develop the site using his redundancy pay. What’s your background and how did you come up with the idea for the site? I’m originally from Newcastle and worked for British Airways as an IT developer. I moved to London for my job and went from a 4 bedroom house to a one bedroom flat. I’m an avid reader and had loads of paperbacks. If people have space, their books go under the bed or on the shelf. I had no space and had to de-clutter everything. So I started giving them away to charity shops. I went through pretty much the same process; I would buy a new book every month, read it and then drop it off in a charity shop. But I could never find books there I wanted to buy. If I had just finished a James Patterson, then I would want to read another one. But if the charity shop didn’t have it I would have to go to Waterstones and buy a new one. After a while I just thought: this is crazy; there must be a better way to do this. That was the beginnings of the idea but I didn’t look at it properly until I lost my job. How many people use the site? We have about 100,000 members. What sets you aside from sites like Amazon or even eBay? Our site is more like a book club; it’s a community doing it to benefit each other. It’s for people who want to share their books with each other and at the same time raise money for a good cause. It adds to the whole feel-good factor of the site. When you join us, you get an online account and every time you sell, you can either have the money refunded to you or use it buy new books. Everyone should benefit, whether buying or selling, and ideally, we want our sellers to have enough credit from sales to buy their next one on the site without ever needing to use a credit card. I think probably promoting the site. I have no experience with the marketing side of things. My background is computers and IT, so I didn’t have a problem with the technical side of the site. But I suppose I naively thought after 6 months that once we had a great website, people would naturally come to it. Like I said, we’ve never advertised it, and it’s been a very slow process. I started off and it was just me and I massively underestimated the time it takes to do everything. Where do you see the site in five years time? I would like GreenMetropolis.com to be the main ethical alternative to Amazon for second hand and charity books. For myself, I would like to work a little less, so that I can read a little more. This entry was posted in Books, business startups, entrepreneurship, going green, social enterprise, Web 2.0 on 21 March 2011 by ninfield.